I'm not a pro-gamer! I don't have a liquid cooled beast of a rig at home where I sit back and play my favourite games all day. As much as I would like to, my work, unfortunately, does not allow me so much of free time at home. However, as a small time gamer at heart, I try and make do with a few games on my laptop. My current laptop is a MacBook Pro late 2017 (non-touch bar) edition. This Beauty came with a 2.3 GHz i5 processor and a lowly 128GB PCIe based SSD storage. I do occasionally play a few games on this laptop but owing to tiny storage, I couldn't install any more than just a few light games on it. While looking for a higher capacity SSD, I also realised that I needed a premium SSD that's specifically designed keeping gamers in mind. 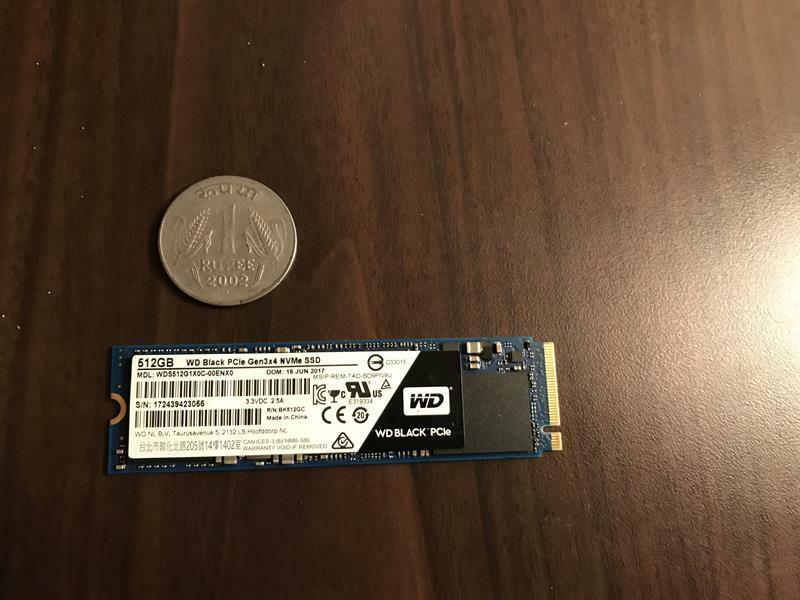 While the regular SATA SSDs out there in the market perform very well when compared to conventional hard disks, I had my mind on the PCIe SSD for this requirement. The Western Digital Black series PCIe M.2 SSDs are specifically designed to match performance required for high intensity and high-performance games. The NVMe technology coupled with the PCIe slot speed gives this SSD up to 3 times the speed of a normal SATA SSD. 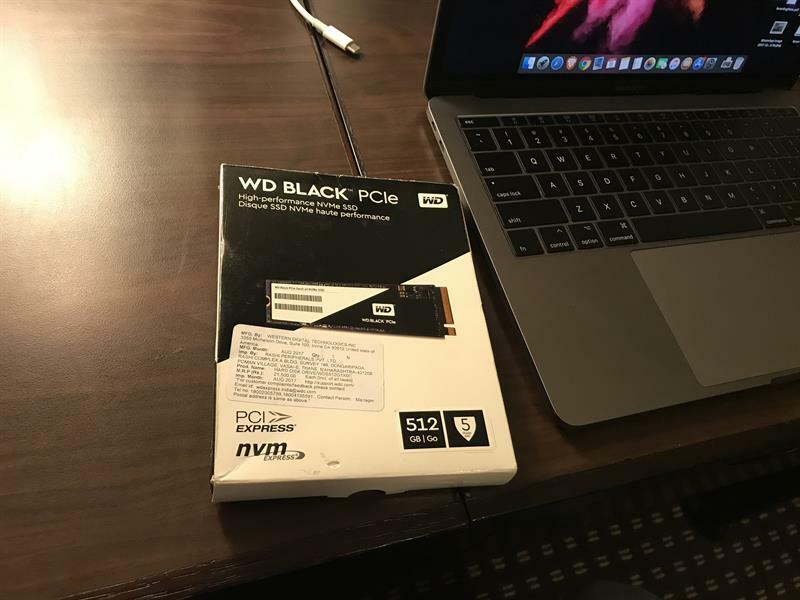 Since my MacBook Pro only has an m.2 slot for solid state drive, I decided to opt for the PCIe M.2 Black SSD from Western Digital. 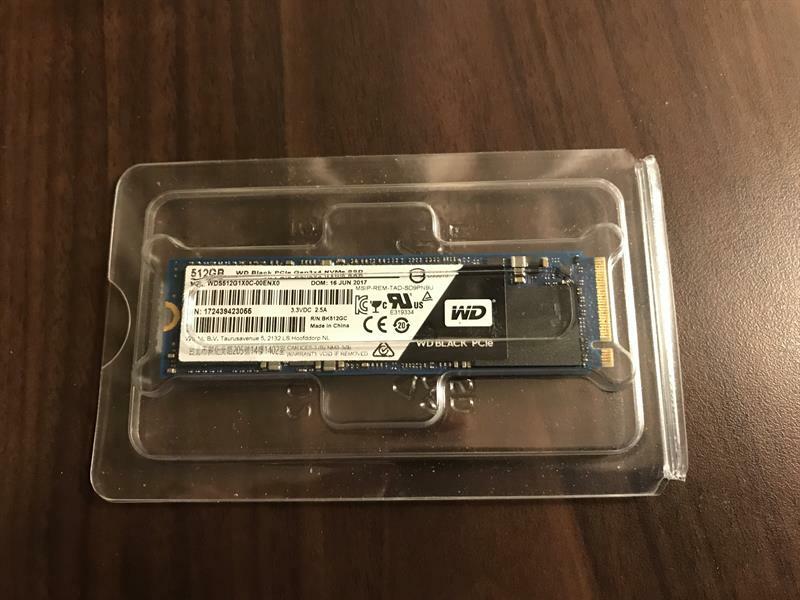 The WD Black 512GB SSD comes in a similar packaging as all of its other siblings. 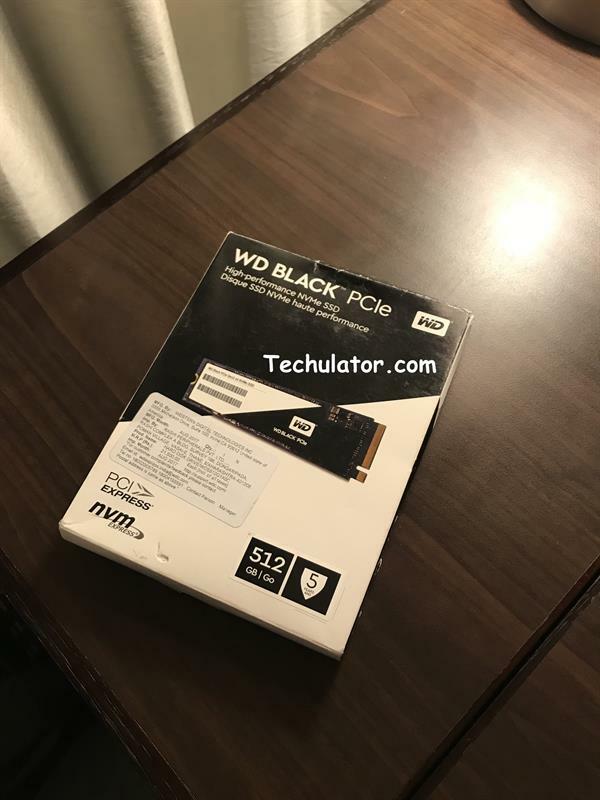 I recently reviewed the WD Blue SATA SSD on Techulator and packaging for both of these devices are pretty similar barring the color branding. It is extremely lightweight at under 15 grams and feels tiny. This SSD is perfect for new age ultrabooks and MacBooks that save on as much space as possible to make their computers lighter and faster. A word of advice for those looking to buy an SSD for their laptops/ultrabooks, before you buy an SSD, please confirm the interface your laptop uses for SSD storage. The PCIe interface connector and SATA interface connector on M.2 SSDs have different connectors. This is how a PCIe connector on the SSD looks like. The installation procedure for this SSD is the same as any other M.2 SSD. Please make sure that you disconnect the battery before beginning the installation. You can then either go for a fresh OS installation or have it cloned beforehand. I've been using SSDs on my laptop for quite some time now. I'm used to of the fast boot up times and great rendering speeds while editing videos for my YouTube channel. After installing the WD Black PCIe SSD, the main difference I noticed was in the loading speeds of games on the computer. Not only were games loading much faster but also they felt much better with low latency. 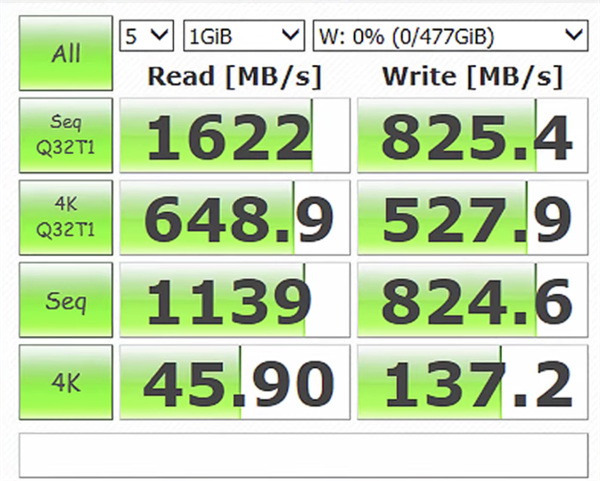 The PCIe slot combined with the NVM Express technology on this SSD sure was doing its job pretty well. I am amazed looking at the sequential write speeds results. This has got to be the fastest write speeds that I have personally seen with on my own computer. I have in the past used SATA SSDs from Transcend, Samsung and Western Digital. However, in terms of speed, WD PCIe SSD takes the cake. Here's how the speed test results look like when compared with the SATA based WD Blue SSD and Transcend SSD. Please note, that these tests were done in-house on different systems running different operating systems. These results may be taken as guidelines and not benchmarks since there are various other parameters that need consistency to make accurate benchmarks. Games like Counter-Strike: Global Offensive and Rocket League play amazingly well and much better with the WD Black SSD. The CS Go game loading times are less than 12 seconds on the WD PCIe SSD and I can play at higher fps without any lag. 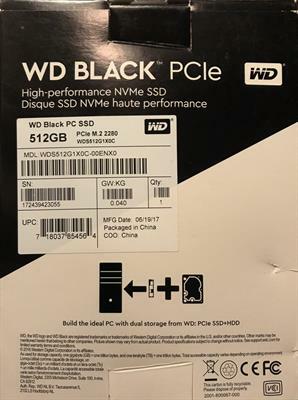 I also used to play Microsoft Flight Simulator on my Windows system but to be able to check its performance, I would need to install this SSD on a system running Windows. Western Digital provides a 5-year warranty on their SSDs, the details for which are easily available on their website. 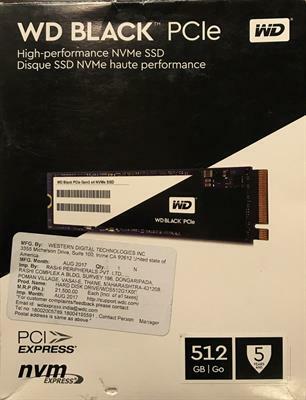 The price on the box of this SSD is INR 21,500 for the 512 GB version, however, you can easily buy it at a much cheaper price from the links mentioned below. If you have any questions about this product, please leave a comment below and I will try my best to answer it as soon as possible.